The past few months have been a creative slump for me, being unemployed and dealing with a broken foot etc. I’m going to get my cast off on June 28th and I’ve got a full time position at Gold Star Chili as Catering Coordinator, so things are turning up. I was worried for how the Green Lantern movie turned out and I was not disappointed in how disappointed I was with the film. Seriously, it was awful. That being said, I made me mad enough to hit the old keyboard up once more. So check out my review below and let me know what you think! I generally don’t write reviews, but felt truly compelled to voice my thoughts on this summer’s third and by far worst superhero movie, Green Lantern, directed by Martin Campbell. Being a both a film buff and a comic book fan, I am always equally drawn and afraid of such summer superhero blockbusters. I have no doubt that many of my film critic contemporaries turn their nose down at the superhero worshipping fanboy demographic, but I believe it can truly be a unique way of telling a great story. This sadly brings me the colossal disappointment that is Green Lantern. Following the success of heavy hitters like the recent Batman, Spider-Man and X-Men franchises, comic book rivals DC Comics and Marvel comics have been bringing what used to be considered B-list heroes to the forefront. Since the creation of Marvel’s film company, Marvel Studios, we have seen great adaptations of both Iron Man and most-recently Thor. Sadly, DC is very far behind, and Green Lantern doesn’t seem to be helping. The Iron Man films and Thor were considered successes critically and commercially. Green Lantern seems to only have achieved the latter so far. Green Lantern begins with a large amount of exposition/info dump about the Guardians of the universe, who watch over the universe and formed a police force known as the Green Lantern Corps. The Corps is spread out across the 3600 sectors of the universe, each equipped with a ring powered by pure willpower. We also learn of the dangerous enemy Parallax, who the Guardians imprisoned decades ago. Parallax is a large cloud of smoke with a malevolent face; if you are rolling your eyes already, there’s little hope for you. Parallax escapes his prison and attacks and mortally wounds the Green Lantern Abin Sur, whose ship crash lands to earth. On Earth we are introduced to Hal Jordan (Ryan Reynolds), who is a cocky and carefree fighter pilot who works for Ferris Air. We are also introduced to Carol Ferris, played by what seems to be the actress Blake Lively but might has well have been another stand in CGI character. We get the sense that Hal and Carol share sexual tension and a romantic past, but it never seems to amount to anything remotely interesting. Eventually Hal is chosen to be a successor to Abin Sur’s ring and is transported to OA, the home of the Green Lantern Corps. There he learns the ropes of “ring-slingin” from CGI characters Tomar-Re and Kilowog (Geoffrey Rush and Michael Clarke Duncan, respectively) as well as Sinestro, the head strong self-appointed leader of the Corps played with gravitas by Mark Strong. After spending roughly five minutes on OA, Hal quits and returns to earth and gets into a couple fights with former childhood friend and current telepathic creep Hector Hammond (played by a whiny Peter Sarsgaard), who has been infected by Parallax. Hammond’s forehead gets bigger and bigger, as do his girly screams. Eventually, Hal realizes his duty and must save his planet from Parallax; which really is such an anti-climactic finish. He uses his powers to defeat Parallax in one of those classic popcorn movie tropes that can only be described as “one of those seemingly meaningless throwaway lessons learned earlier in the movie but actually turns out to be important after all.” The solution seems so simple that it’s pretty unbelievable that a cocky new guy could defeat an enemy that an entire army of space cops couldn’t, but I guess I’m just nitpicking now. I am so distressed with this movie in part because Geoff Johns was a producer and creative consultant on the film. Johns is a DC Comics darling who reignited Green Lantern back in 2004 and is solely responsible for the success and popularity of the series’ mythos. Much of the stories are space-age metaphors for overcoming fear and persevering, but this comes across a bit heavy-handed in the film. The Green Lantern mythos has been compared the Star Wars franchise; sadly, the film dredges up memories of the recent prequel trilogy rather than the classics of the late 70s and early 80s. Just like Lucas did in the prequels, it seems that the filmmakers of Green Lantern relied too heavily on CGI characters instead of actors. I suppose this is a minor detail, however, since we barely spend much time on OA with other Corps members. The animation of the film just leaves much to be desired. With a $200 million budget, you would expect more Avatar-worthy computer effects. The script feels rushed and thin, introducing many different elements briefly and never touching on them again. Another issue I have is with the score. Part of the success of the Superman, Spider-Man and Batman franchises has been their epic, empowering instrumentals. 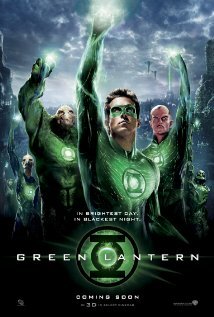 The score in Green Lantern, written by James Newton Howard, never carries the emotional weight that the film so desperately wants to achieve. It almost feels like an MTV music video, which may be the demographic the producers had in mind after all. I find that whenever you really lead the charge to see a movie with friends you are held accountable for their level of enjoyment. I spent most of the movie stretching the neck of my Green Lantern t-shirt (yeah, that’s right) over my face and occasionally glancing at my friends to see their reaction. It seems that they were mildly entertained after all, so I guess there’s that. Reynolds gets by playing Hal Jordan, but only barely. The film’s strongest performance is Mark Strong’s Sinestro, who deserved more screen time and development; Jordan and Sinestro’s relationship is a complex one that could have benefitted from a few more scenes. Green Lantern tries to translate a lot of mythology into fun like Thor did a few weeks prior. Whereas Thor managed to maintain a child-like smile on my face, Green Lantern just made me want to get a drink and forget it ever happened.